Implant dentistry is now an integral part of everyday dental practice; however, most dentists receive their education in implant dentistry after graduation, with little emphasis on the identification of the complexity and risks of treatment. Since 2003 the International Team for Implantology (ITI) has recommended the SAC Classification to categorize implant treatment procedures into three levels of difficulty-straightforward, advanced, and complex. 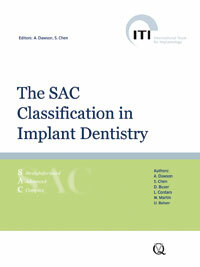 In 2007 the ITI organized a conference to standardize the application of the SAC classification, the conclusions of which are presented in this volume. This invaluable resource will help clinicians identify treatment complexity and risk before treating a patient, thereby improving the predictability and success of their outcomes.